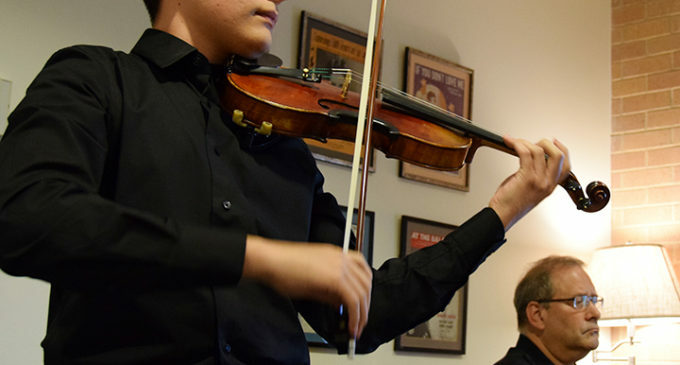 Nearly 40 people attended the Music Library’s opening concert Thursday for the new Sandborn Music Reading Room, which contains a wide collection of rare music books, instruments and other music items. The concert began at 3 p.m. in Willis Library 430A, the Sandborn Music Reading Room, with head music librarian Mark McKnight welcoming those in attendance. He also talked about the historical context of some of the rare books and items in the collection. Those who attended received a pamphlet, which contained a schedule of events, lyrics and translations to the songs played, a brief history of the Sandborn Collection, a list of performers and some information about the instruments that were used. Some undergraduate music majors even got to showcase their skills by either playing instruments or singing. After the welcoming were the musical performances. Music library employees and members from the college of music played selected movements from eight pieces from the collection, including Bach and Beethoven compositions. The Sandborn Music Reading Room officially opened in 1991 when it was called the Edna Mae Sandborn Music Rare Book Room. It began as a result of Lloyd Hibberd, who was a UNT music professor from 1945 to 1965, donating some of the books he bought in Europe to the Music Library. The concert was held to celebrate the opening of the new room and in honor of some past music librarians. Some of the rare items of the Sandborn Collection are placed in the reading room, while other pieces are spread throughout other parts of the Music Library. During each performance, the audience members were silent, as one would expect when going to a concert featuring classical and other older forms of music. After the performance of a piece ended, people clapped, looking forward the next piece. Performers would also give brief descriptions behind the meaning of each piece.. Associate head music librarian Andrew Justice, who was in charge of the concert, said he hopes more concerts like this can be held in the future. The recording engineer for the concert was Justin Lemons. He said he was happy to help out, having known Justice for years. Music library preservation head Jessica Phillips, who was in the audience at the concert, said she was not familiar with any of the pieces that were played, but she is glad she went.